It's always refreshing to have a simple outfit and beautiful accessories- today was one of those days. I opted for comfortable linen shorts and a loose white sweater. 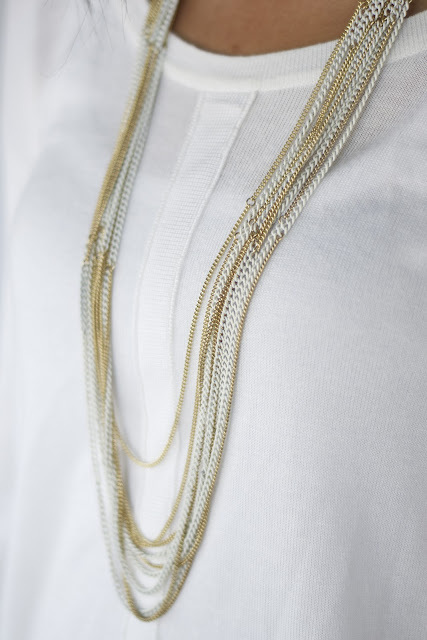 I accessorized with this multiple chain necklace from Target; what I love about this piece is the alternating colors of chains between gold and white. Then to add some color, I wore these bright wedges. I saw them in the beginning of the summer, but didn't want to spend too much on them. Luckily, when I came home from camp they had been clearanced...twice! How can you say no to that?! What brand are the wedges? You are adorable! I love all of your outfits, and how good a deal they all are! Thank you! I try to put together outfits that are affordable and budget friendly. Love the details of this outfit, meaning I get what you mean! Simplicity with some brilliant accessories like these wedges! Gorgeous! Where are they from?! Are they still available?! They're from Marshalls. Check the clearance section!